So you consider yourself a master of smooth lines1/3 Well then we've got an offer you can't refuse! you'll get the smoothest lines in existence from uni-ball. But that's not all - you'll also get a grip on it! That's right, all the features you know and love in a uni-ball AND a rubberized grip for added comfort and control. The kind of comfort that makes you want to use it again and again. When you promote yourself with the updated uni-ball Grip Fine, you're not just suave, you're Smooth..Real Smooth. New design with four colors to choose from Non-refillable, 0.7mm tungsten carbide ball delivers a 0.5mm line width. uni-ball Grip Fine can be customized with a multi-color imprint. Features: * Comfortable grip ensures fatique-free writing * Tungsten carbide ball * Stainless steel tip Ink & Point Styles * 0.7mm tungsten carbide ball * 0.5mm line width * Non-Refillable, Ink color matches cap insert color. The Uni-ball 207 Impact produces thick, vibrant lines while the smooth grip provides added comfort and control. 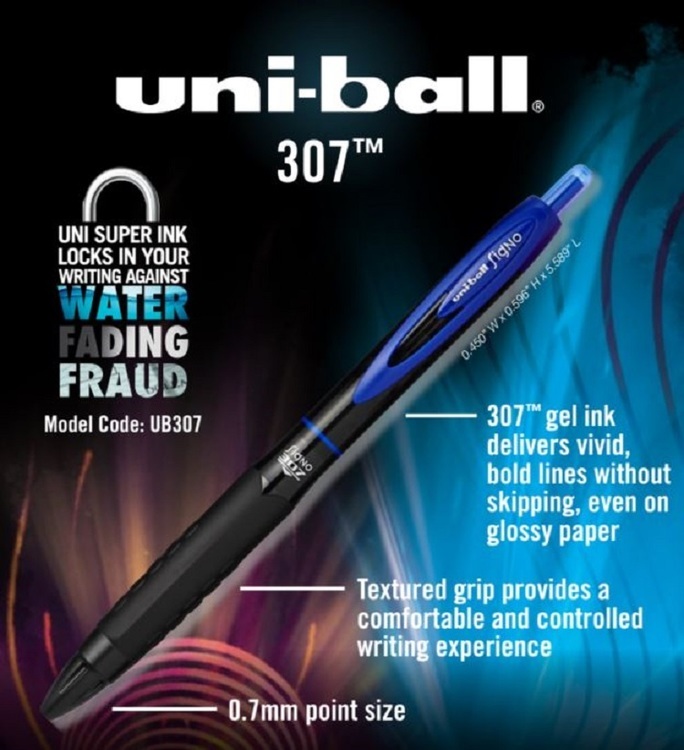 Like most of our uni-ball pens, it also features uni Super Ink™ that helps prevent against check and document fraud. This pigment based ink contains particles that form an indelible bond- it can’t be broken…ever. • Sleek design with a modern metallic sheen! 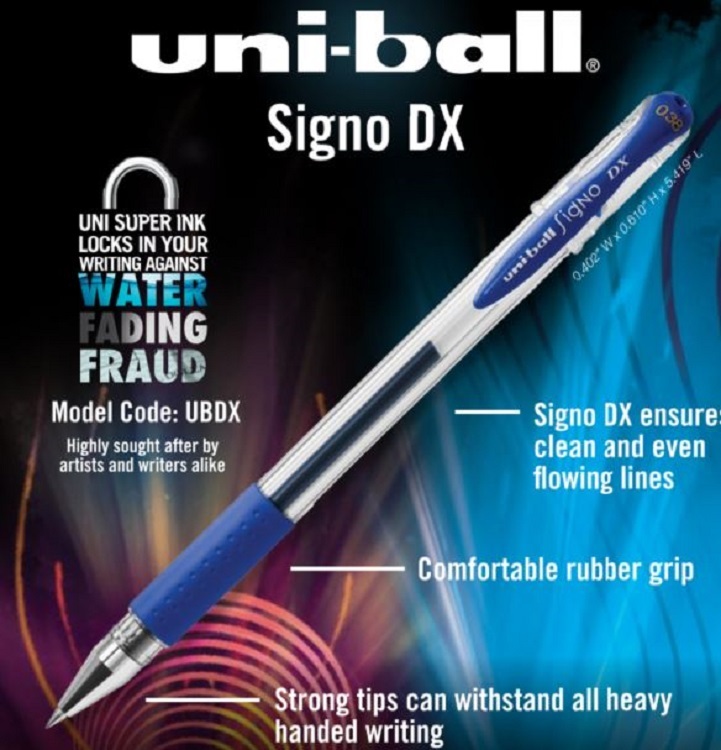 • Features Uni Super Ink that helps prevent against check and document fraud. • Fade- and water-resistant ink. • 1.0mm point for a thick, BOLD line. • Smooth grip provides superior writing comfort and control making this pen truly a pleasure to write with. • In the retractable version, an innovative, spring loaded clip automatically retracts when clipped onto your pocket. The trouble with not being able to see it, is that you may be surprised to find out that it's suddenly gone. Fortunately, the uni-ball Vision gives you a clear view of exactly how much ink you have. You'll also see how the unique uni-Flow ink system delivers smoth, scratch-free wirting with a consistent flow of ink to paper - down to the last drop. All you're left with is high tech, high style smoothness. Envision your name on the uni-ball Vision - it's the smooth way to get ahead. Ink color matches trim color Non-refillable, 0.7mm tungsten carbide ball delivers a 0.5mm line width. Waterproof, pigment ink. uni-ball Vision can be customized with a multi-color imprint. Features: * Tungsten carbide ball * Stainless steel tip Ink & Point Styles * 0.7mm tungsten carbide ball * 0.5mm line width * Ink color matches trim color. Capture some attention with your name on the newly designed, Uni-ball Gel RT. A comfy rubber grip combined with superb gel ink technology help deliver a smooth line to suit your smooth message. Get your name on a Gel RT and start getting some attention. 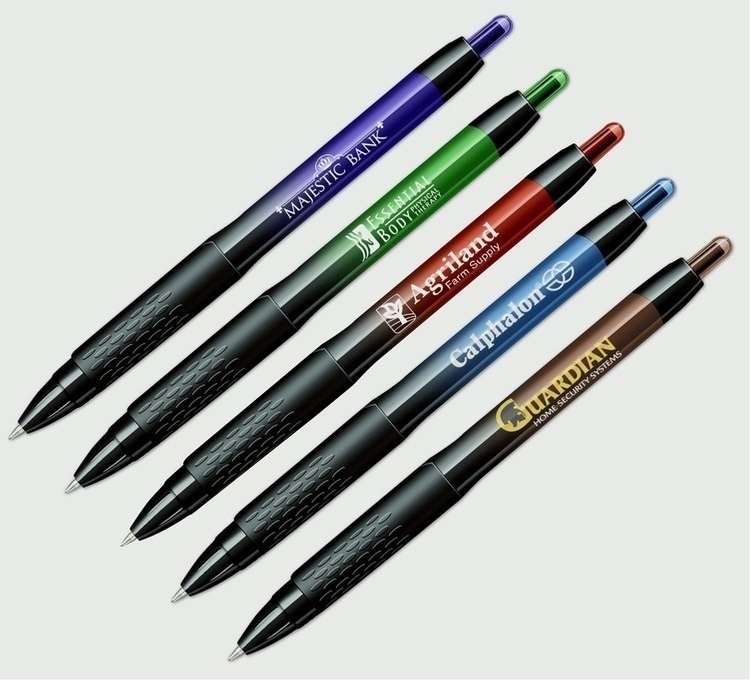 Ink color matches trim color Refillable, 0.7mm point Uni-ball Gel RT can be customized with a multi-color imprint. The #1-selling metal point roller in America is coming out of its shell. Pearlized finishes on the Uni-ball Micro add exciting luster to this classic favorite. It still provides the same smooth-flowing performance that everyone has come to love, but now it's dressed up and ready to go out on the town. With a style appropriate for any occasion and a brand name that's universally respected, you can't go wrong when you choose the Uni-ball Micro or Uni-ball Fine for your next promotion. Micro point: Nonrefillable, 0.5mm tungsten carbide ball delivers a 0.3mm line width. Waterproof, pigment ink. Fine point: Nonrefillable, 0.7mm tungsten carbide ball delivers a 0.5mm line width. Waterproof, pigment ink. Uni-ball Micro and Fine can be customized with a multi-color imprint. 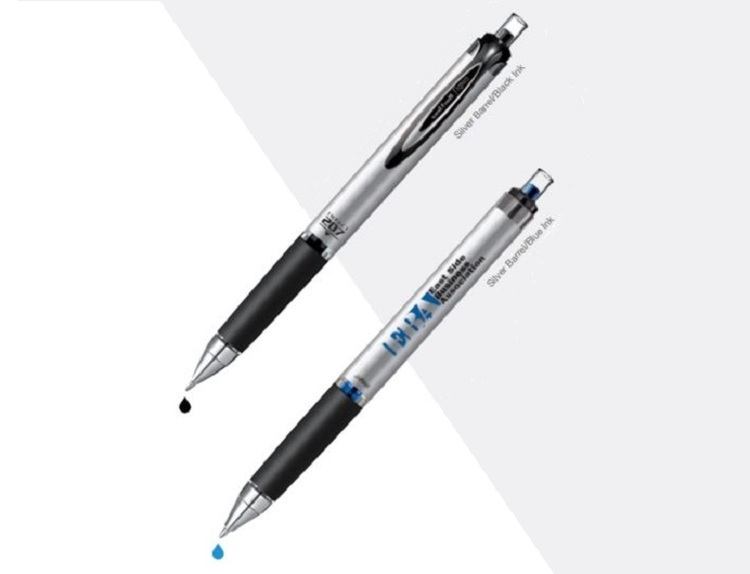 Ink & Point Styles * 0.5mm tungsten carbide ball * 0.3mm line width * Non-Refillable, blue or black ink. Smooth, dependable gel ink and contemporary styling come together for a neat looking, great writing pen with the Uni-ball Gelstick. And with the wide array of colors, your company's logo is sure to be noticed. 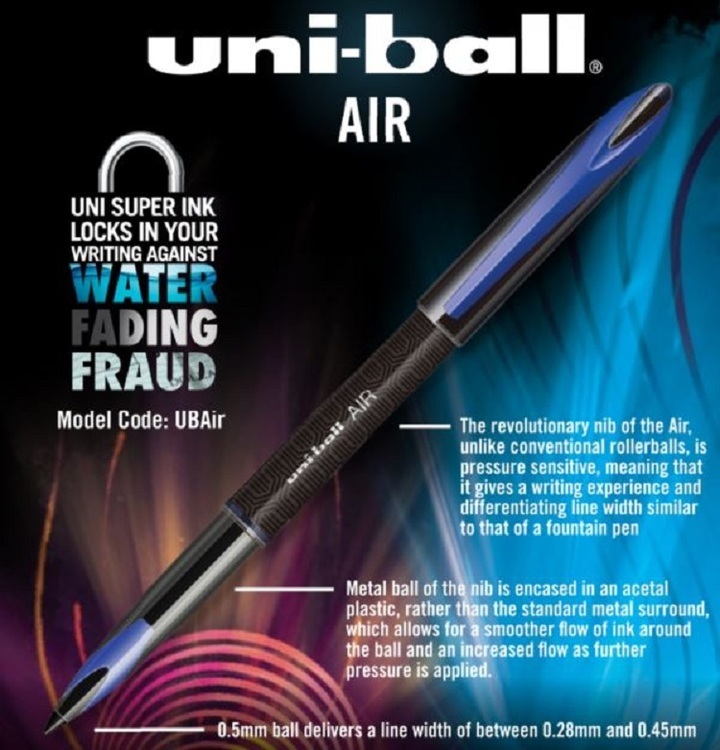 The Uni-ball Gelstick - bringing value to a new level. Ink color matches trim color. White barrel has black ink Non-refillable, 0.7mm tungsten carbide ball delivers a 0.4mm line width. Fade proof, waterproof, pigment ink for a permanent mark. 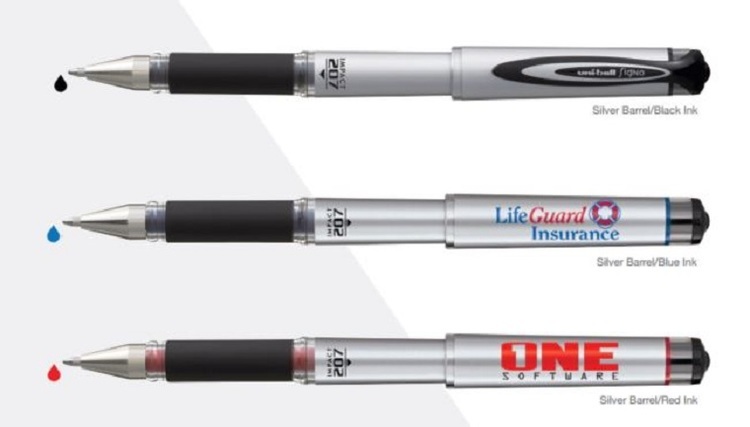 Uni-ball Gelstick can be customized with a one-color imprint on the barrel or a multi-color imprint on the cap. Features: * Twin ball structure provides a uniquely smooth write with no leaking. * Tungsten carbide ball. * Stainless steel tip. Ink & Point Styles * 0.7mm tungsten carbide ball * 0.4mm line width. * Ink color matches trim color. * White barrel has black ink. Modern styling and innovation come together with the Uni-ball Vision Elite. This sharp looking pen will not only change the way you look when you write, but also where you can write. The patented design on the Vision Elite prevents ink from leaking during the rapid air pressures that occur on airline flights. Thanks to the new Vision Elite, when it comes to writing, the sky is no longer the limit. •Elevate your everyday with the sophisticated style of Uni-ball Designer Series™ Ink Colors: Silver,Gold,Blue,Pink,Black Fade proof and waterproof pigment ink 0.8mm tungsten carbide ball delivers a 0.6mm line width. Uni-ball Vision Elite can be customized with a multi-color imprint. Features: * Airplane safe technology * Smooth ink flow controlled by the Direct Ink Method * Fountain pen quality with first class design * Tungsten carbide ball * Stainless steel tip Ink & Point Styles * 0.8mm tungsten carbide ball * 0.6mm line width * Refillable. Ink color matches cap color. Modern styling and innovation come together with the Uni-ball Vision Elite. This sharp looking pen will not only change the way you look when you write, but also where you can write. The patented design on the Vision Elite prevents ink from leaking during the rapid air pressures that occur on airline flights. Thanks to the new Vision Elite, when it comes to writing, the sky is no longer the limit. Ink color matches trim color Fade proof and waterproof pigment ink 0.8mm tungsten carbide ball delivers a 0.6mm line width. Uni-ball Vision Elite can be customized with a multi-color imprint. Features: * Airplane safe technology * Smooth ink flow controlled by the Direct Ink Method * Fountain pen quality with first class design * Tungsten carbide ball * Stainless steel tip Ink & Point Styles * 0.8mm tungsten carbide ball * 0.6mm line width * Refillable. Ink color matches cap color.